The Oversoul Seven Trilogy (eBook) - Amber-Allen Publishing, Inc. Inspired by Jane Roberts’ own experiences as the author of the immensely popular “Seth Books,” these three novels — now collected in one volume — are one of the most imaginative tales ever written. 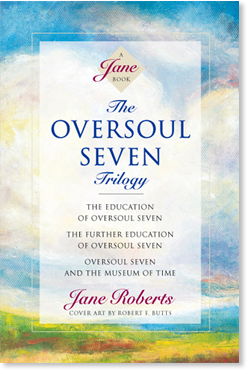 In The Oversoul Seven Trilogy, Jane Roberts’ beloved character, Oversoul Seven, an ageless student of the universe, explores the entire framework of our existence. Jane Roberts fans, and all readers intrigued by reincarnation, dreams, out-of-body travel, and spirituality will love exploring the cosmos of consciousness with Oversoul Seven in these insightful and genuinely moving novels. As we follow Seven’s education, our own beliefs about life, death, dreams, time and space are challenged and stretched, leaving us with a refreshing and provocative perspective on the true nature of reality. In Oversoul Seven and the Museum of Time, Seven is instructed to take up residence in a human body while also journeying to the Museum of Time in search of the “Codicils.” The Codicils are eternal truths that bring about the greatest opportunities for vitality, understanding, and fulfillment. The adventures of Oversoul Seven are at once an intriguing fantasy, a mind-altering exploration of our inner being, and a vibrant celebration of life! Oversoul Seven grimaced at Cyprus and began the examination. “Let’s see,” he said. “In Earth terms, using an analogy, I’m a man on Wednesday and Friday, a woman on Sunday and Thursday, and I have the rest of the time off for independent study. Oversoul Seven nodded, then suddenly, almost despite himself, he started to laugh. “Actually, Josef is almost on the edge of knowing. Once he forgot to materialize one of his painting brushes—he was in the throes of creativity—and bongo, the brush was just gone. Josef almost went out of his mind.” Seven’s eyes glowed with parental-like pride. Oversoul Seven looked around cautiously. He’d been secretly quite pleased with the environment he’d chosen and created. The classroom was authentic twentieth century, like the one Lydia knew as a child. There were rows of desks, blackboards, windows, everything right down to stacks of paper—all individual new sheets—and an automatic pencil sharpener. Then he blushed, all over his nice new cheeks and right up to the roots of the thick brown hair that sprang up from his forehead. “I found it, the error! There!” The wastepaper basket had been in the corner, complete with girth and thickness, exactly two feet high and as many around, but he’d forgotten to materialize it visually. Now he made it red, and with a flourish added scallops around the upper edge. “But there’s still another error,” Cyprus said, looking nowhere in particular. Just at that moment a young man wearing a toga appeared. He looked around with a rather wild air, then shouted out at Seven: “Ah, there you are! I knew I’d find you again. Just the same, all this has to stop.” He looked half mad, and yelled in tones of deepest outrage. Cyprus raised her eyebrows at Oversoul Seven, who coughed several times and tried to look the other way. Chapter 8: Dr. Brainbridge Is Confronted with Proof of the Impossible: Or Is He?